Is she tired of life or love? Why else is Haewon falling asleep in a restaurant? Haewon, a student, feels abandoned. Her mother is about to emigrate to Canada and Haewon has decided to end her affair with one of her professors because he is so unsupportive. Not only do Haewon’s fellow students get wind of the affair, but her married paramour refuses to accept that their relationship is over. Confused, Haewon withdraws into her shell. 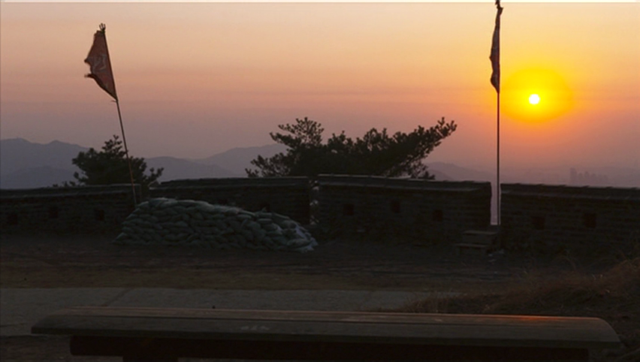 Other men cross her path which eventually leads her to an old fortress in the mountains above Seoul. There she finds not only rice wine and a familiar melody, but also a bold escape route. In his previous films, Hong Sangsoo explored love’s unfathomable paths and the impossibility of relationships from the point of view of his male heroes. Now he changes perspective. However, the emotional world of his protagonists is no less puzzling and fickle – just like Haewon herself, a young woman who likes to dream. And perhaps this film is simply one of these dreams, from which she will awake to find herself in the strangest of places. For who can say how unreal our waking life is, or how real our dreams?